I’ve now got her figure mostly painted, liking how her hair turned out. I had pictured her skirt being very flat, as I’ve made it, but now I’m wondering if it needs a little more lighter modeling around her thigh. 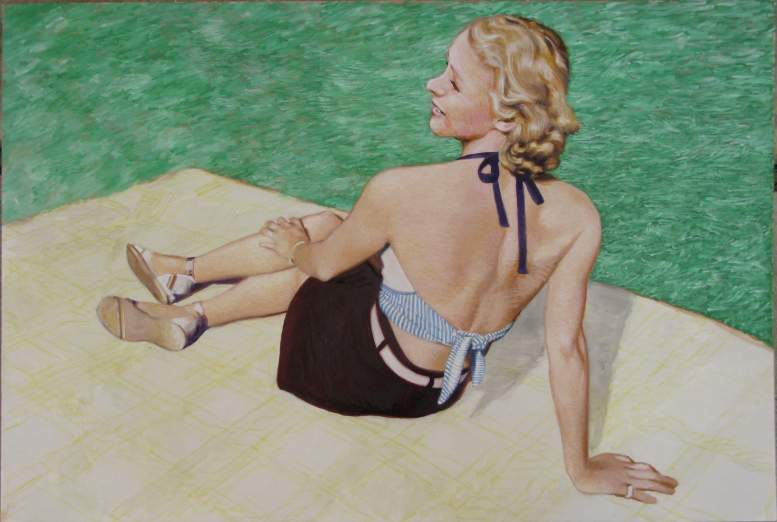 I think I’ll move on to the beach towel anyway as I give that some thought. Just a little more to show on her figure. 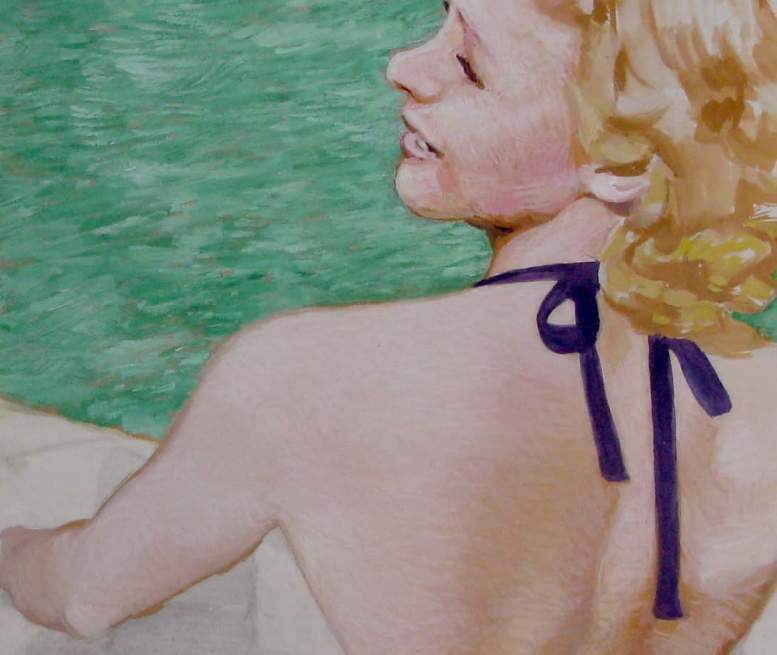 I wasn’t happy with her skin tone looking too pink, so I repainted some areas with a thin glaze of raw sienna. I think it’s back on track now. 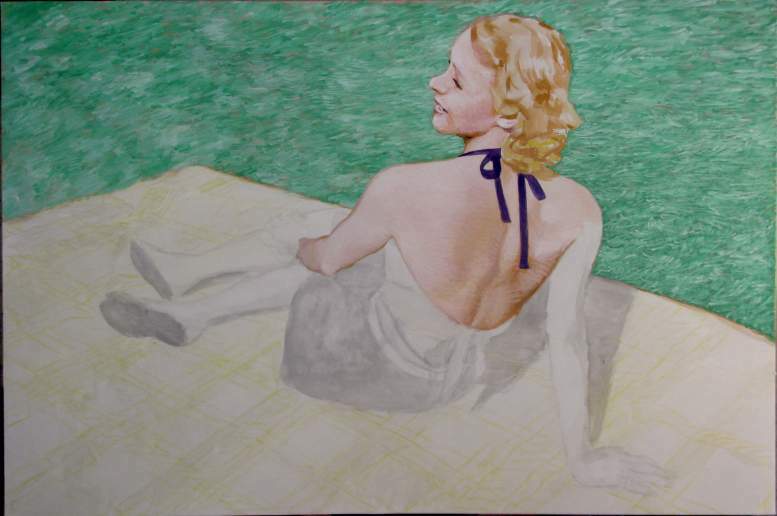 Making a little progress on the figure of Jan. I’ve got her head and back mostly done, with her hair loosely roughed in. The brush strokes on her face needs some smoothing out, but I’ll get to that later. I wound up not needing to do any scratching through the paint as I anticipated on this surface, but I like the feel of it anyway. The thin coat of plaster takes the paint really well. 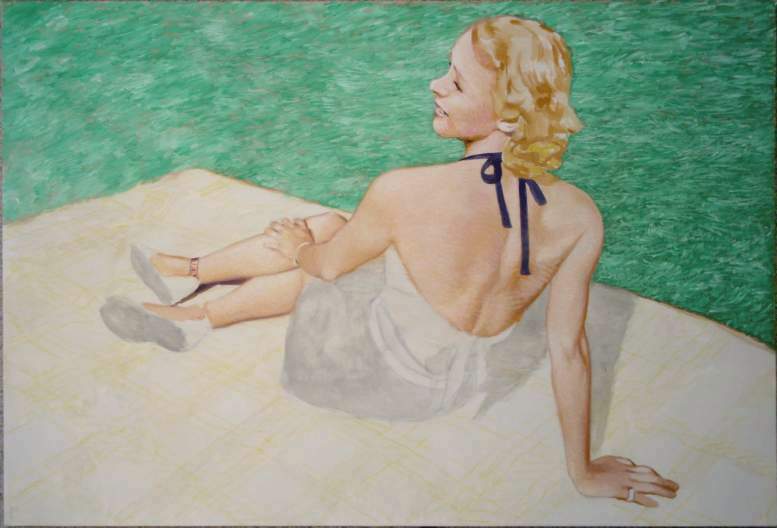 Now I’ve got the grass “planted.” I mixed up a neutral red violet wash for the undertone of that area, and used a Winsor & Newton brilliant green and a titanium white I made for the grass. I’ll probably go back later and add more color variation, perhaps touches of yellow green, but I want to get the rest of the surface painted first. 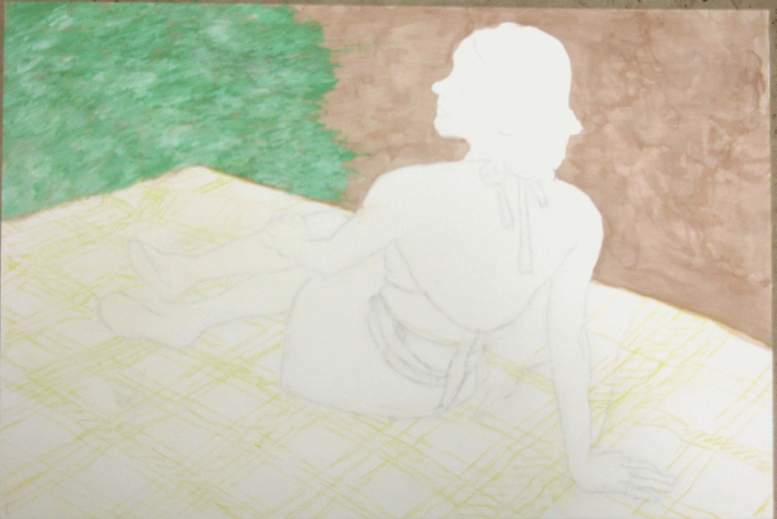 I want the figure and beach towel to remain brighter, so I don’t think I need to do an undertone for that, but will do some more testing on scrap paper to be sure. I’m ready to get the painting started. 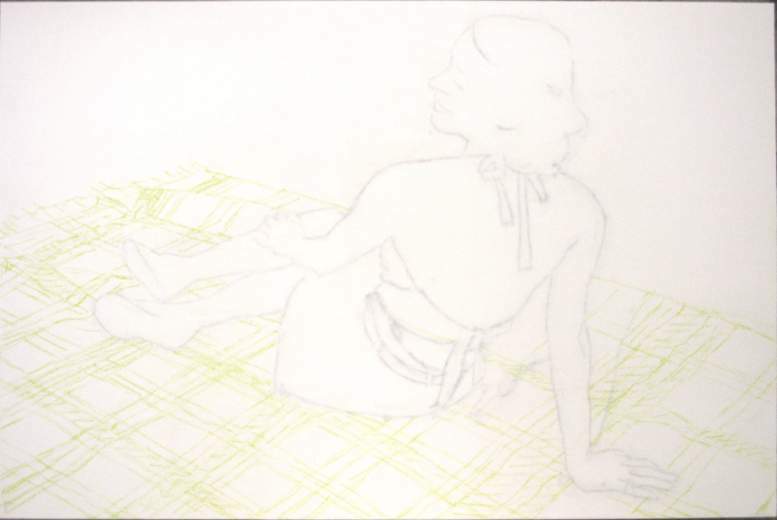 Before I transferred the large sketch, I paused to consider how best to continue. This will be a gouache painting on illustration board primed with a thin coat of spackle plaster mixed with acrylic medium. I made the outline of the figure in charcoal to the bare board (unprimed,) and wondered if I should spray fixative on it as I planned or test out other options. 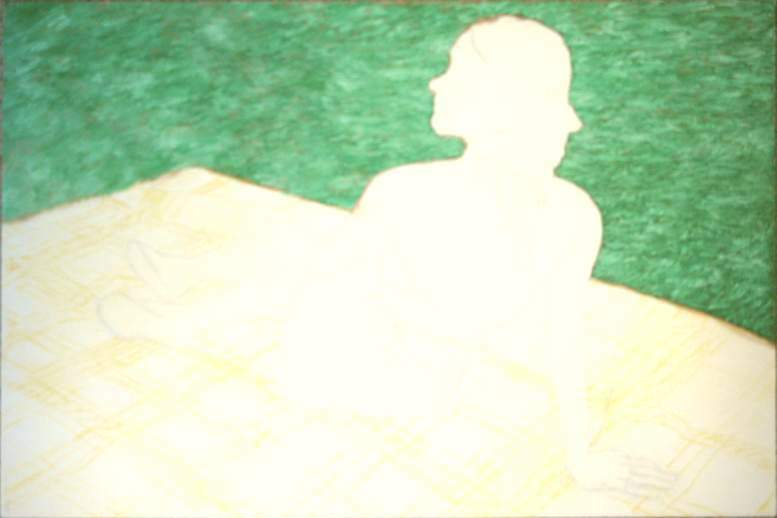 The lines of the beach towel were drawn with a yellow pastel pencil that I darkened in the picture so you can see it better. One idea was to just paint over this with a thin layer of plaster and acrylic (as I tested out in my previous post,) or spray fixative on it and then prime it, or coat the charcoal lines with a thin coat of acrylic and prime it. 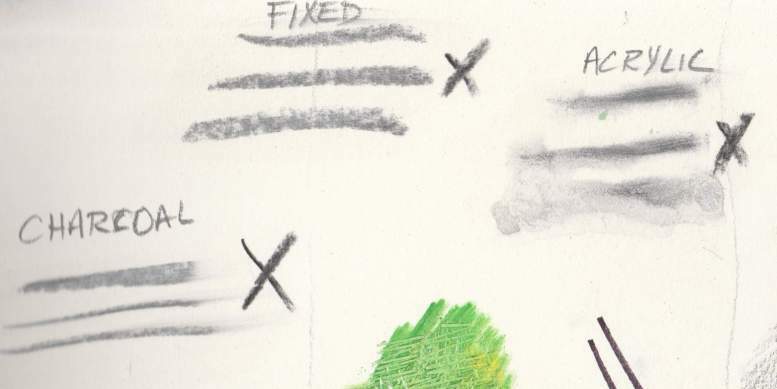 With the primer on top, the gouache will not mix with the charcoal. I made a quick test of those three options on a scrap piece of illustration board. The “X”s in the picture are charcoal marks not coated, so you can see how thin the plaster layer is. The unfixed charcoal smeared a little, but was otherwise okay. The fixed marks (one coat of spray) looked the same, but no smearing. The wet acrylic medium turned the charcoal into a wash, so I ruled that out. I decided to just go ahead and add the thin plaster layer without fixing the charcoal, saving an extra step, and despite a little smearing, it looked okay. I’m finally ready to start painting. As I get ready to prepare the surface for my new painting, I wanted to test out a ground to use especially for the grass area I’ll be painting. I’ll be using a large sheet of illustration board, and coating it with a thin ground made with spackling compound. Spackling is a paste made out of (typically) calcium carbonate, silica, and glycol. You can find it at hardware stores, and it’s used for filling small holes and cracks in walls prior to painting. It can be thinned with water. I’ve added a small amount of acrylic medium to improve the adhesion and make it more flexible. 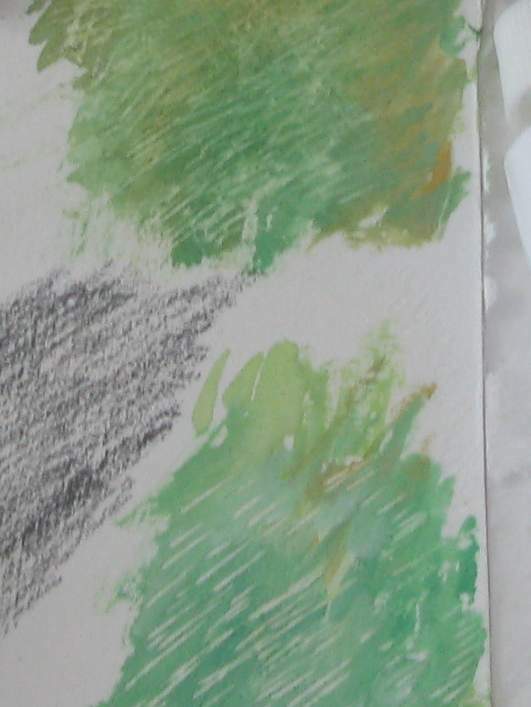 In the picture above, I’ve drawn an area in pencil to show the rough texture it makes. It feels like a fine grit sandpaper. I applied just one coat. It creates a nice paint ground, but can lift if you use a very wet wash. Adding acrylic medium helps prevent that. The main reason I’m using this particular ground is to allow me to lightly scrape away paint layers. 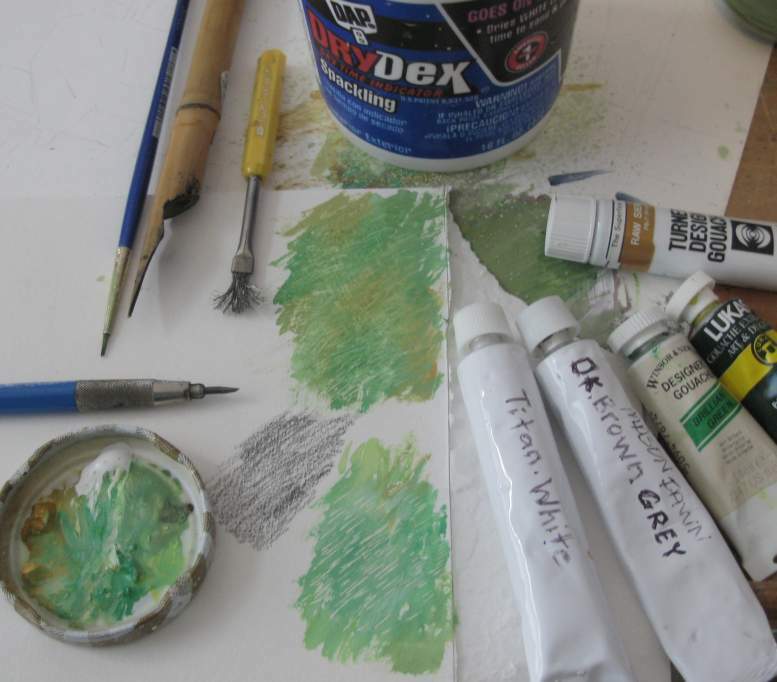 You can see the marks I’ve made on the small test area of gouache paint in the picture. It will help me create a more convincing grass texture. The tools I used here are a bamboo pen and a solder scraping brush. The bamboo doesn’t dig too deeply into the plaster, and the steel brush gives a fuzzy, random scratch. 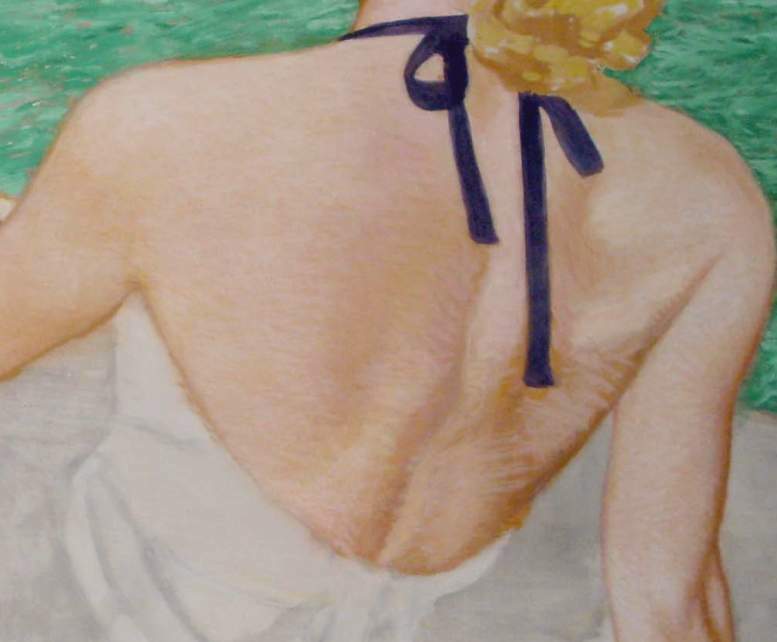 I’m using various commercial gouache paint, as well as a couple of my own. This should work well for me. I’m adding a closeup of the painted area to show the scratch marks better. I’m interrupting my series of posts on the new painting to point out a problem I discovered today with a jar of Casein Gesso from Sinopia. This follows up on two posts I made in the past: one is a review of this product, and another was how I store paint containers like this upside down. 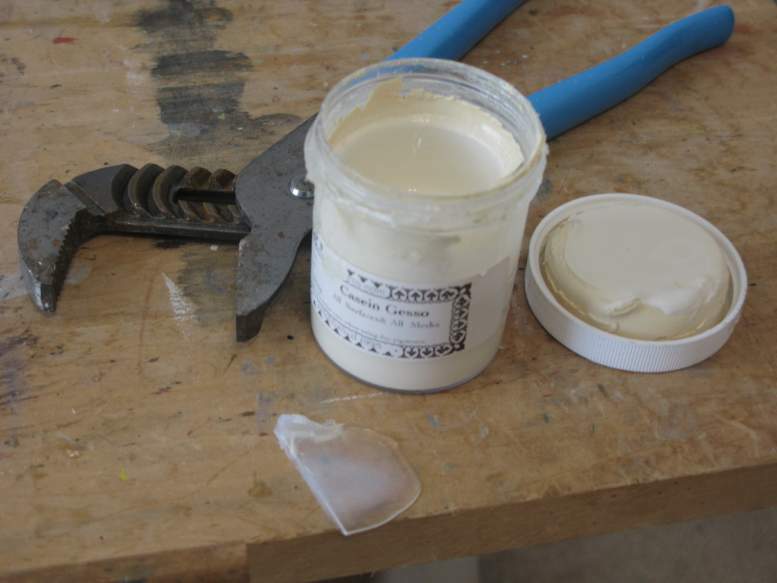 I bought this jar of gesso a little over a year ago, and keep it inside a drawer in my studio. I haven’t used it in awhile, but today I decided to open the drawer to try it out again, only to find the contents had leaked out. The lid was screwed on tight, but that wasn’t enough to stop air from getting in, and some of the contents leaking onto the drawer. Fortunately that was plastic, so it was easy to clean (that’s what that clean piece of gel is in the picture,) but I had to use a plumber’s wrench to get the lid off, and found that about 1/3 of the paint had dried out. That rounded disk inside the lid is about 1/2 inch layer of dried paint, and more dried on the sides of the jar. It had been stored upside-down. As I mentioned in the article link above, I store containers like this upside down just for this reason. Screw-on lids of this type make very poor containers for paint, since air gets in easily. Even if this was stored upright, air gets in, and would have dried out the paint even worse. Some jars you can buy come with cushions inside the lid, sponges or thick paper, that help seal the jar. Another solution I’ve used in the past is to wrap wide tape around the outside. That has to be replaced frequently, but it’s better than throwing away paint. Metal cans for paint make a better seal than a screw-on lid, unfortunately, a quart size can is the smallest available. Tubes are also better since the opening is smaller, so less air gets in. The best option is to use it up quickly. Prime several sheets of paper stock or canvas that you have on hand, and don’t store the left over paint for very long. You are currently browsing the Artwork by D. B. Clemons blog archives for May, 2017.